Spider-Man Into the Spider-Verse Cast Announced, New Trailer | Nerd Much? Sony has pulled the webbing off of their upcoming theatrical animated Spider-Man flick. The studio has announced the primary cast and dropped a new trailer for Phil Lord and Chris Miller’s Spider-Man Into the Spider-Verse. The cast is pretty stacked. Shameik Moore (Dope) plays the lead in Miles Morales. Brian Tyree Henry (Atlanta) plays Miles’ comedic and loving father, Aaron Davis. Miles’ mother, Rio Morales, is being voiced by Luna Lauren Velez (Dexter). Jake Johnson (New Girl) gets to take on the iconic role of Peter Parker. He clumsily mentors Morales as seen in today’s trailer. The movie’s first trailer showed a head stone for who appeared to be Peter Parker. the character infamously died in the Ultimate version of the comics in which Miles Morales was introduced. But in today’s trailer he appears alive and well as he shows Miles the ropes – or should we say webs. Lily Tomlin has also been case to play Parker’s Aunt May. We know that Liev Schreiber has been cast to portray Wilson Fisk/Kingpin, although he doesn’t make an appearance in the newest footage. Mahershala Ali plays Morales’ uncle Aaron Davis. But the character is also the villain Prowler who we do see in today’s trailer. We also get a few quick glimpses of the Green Goblin as well, but who is voicing the role hasn’t been announced. When discussing the style of the film, Lord and Miller stated that they wanted it to feel like “you walked into a comic book.” They intended to use the animation medium to “tell the story using camera moves and pushing the style in ways a live-action movie can’t.” Lord, who wrote the project’s screenplay, went on to state that Spider-Man Into the Spider-Verse utilizes “a totally revolutionary style of animation.” It does look pretty spectacular. 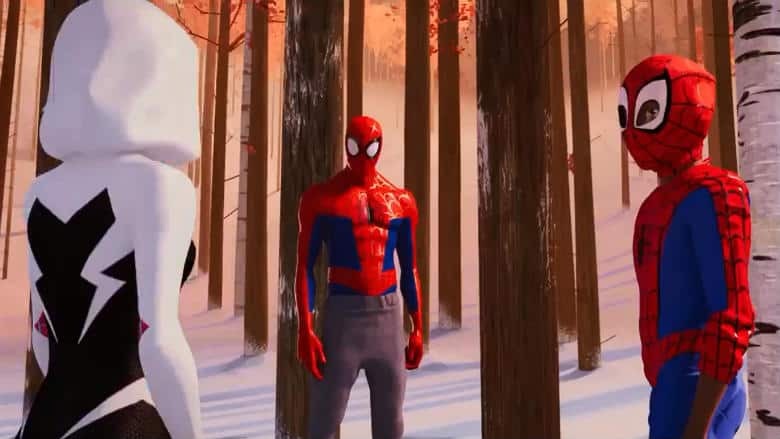 Spider-Man Into the Spider-Verse is certainly looking promising. It’s boasting a talented cast with a duo behind the scenes who have more than proven their abilities in the past. The movie releases in theaters only on December 14th, 2018.